Ua recensione di Due South di Samantha Mitchell è stata pubblicata oggi su Title Magazine. Over three years in the making, Due South is a collection of work from artists from Italy and Philadelphia, created largely in response to experiences with the dynamic culture and landscape of Sicily. It is the second in an anticipated series of four international projects that artist and curator Marianne Bernstein plans to orchestrate, each centered on a different volcanic island somewhere in the world (2014’s Due North focused on Iceland.) “Volcanic islands breed a certain glorious independence,” Bernstein says, “as well as study in extreme contrasts, demonstrated both in the land and its people, inextricably intertwined.” As curator and project facilitator, Bernstein arranged travel and communication between the artists over the course of their work, creating a loose network of artistic connections which culminate in this exhibition. Due South is ambitious, broad, and sprawling, with work from over thirty artists spanning a wide range of themes occupying three large rooms at the Delaware Contemporary. With so much work and without wall text or labels, the exhibition presents as a scavenger hunt for the curious museum visitor. A simple accordion pamphlet – notably absent of a curatorial statement – lists the artists and their works with a brief contextualizing statement to accompany each. This allows the viewer to make their own visual and thematic connections among the work without the burden of expectation, which is at times overwhelming, but ultimately a rewarding experience. While Due South presents as a group of artists reflecting on being in a specific place, its cohesion as an exhibition emerges lyrically, casually, non-linearly, like a meandering street wending its way through an ancient city. The first room offers a dynamic view of the Sicilian landscape through geologic and botanical investigations. 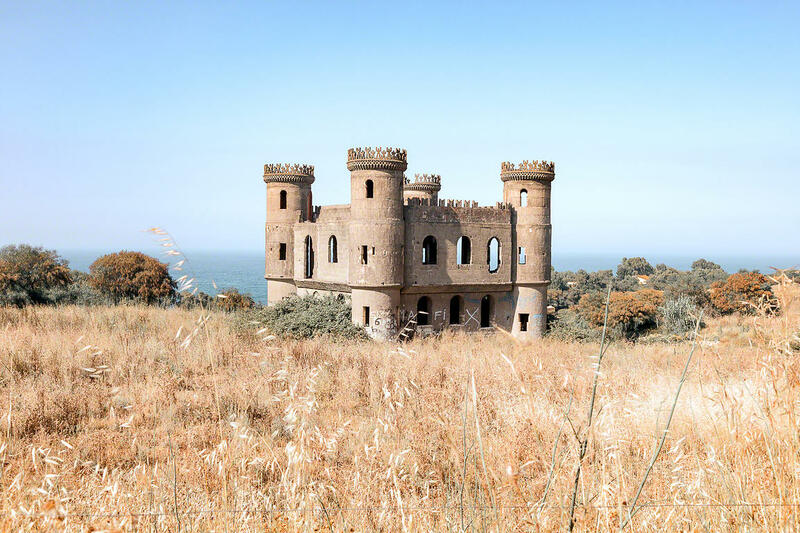 Massimo Cristaldi’s grandiose vistas capture the particular ironies of Sicily’s countryside. E Agone Bagni features a contemporary ruin: a half-built crumbling castle, a planned mansion or dance club built illegally, then forced to stop construction. The multi-layered flattened perspective in Adrano presents as a cross-section of the Sicilian landscape – an ancient roadside shrine, strewn garbage, a crumbling aqueduct, and lush tropical plants all build at the base of a majestic snow-covered Mount Etna. The mammoth scale of the volcano dwarfs and humbles what comes before it, but is also illusory, hovering in the background like a benevolent cloud. Adjacent to this is John Broderick Heron’s taxonomical installation sculpture DIVIETO #1 with a video by Alex Tyson (DIVIETO #2) playing on a small monitor inside. Both pieces were conceived during a trip that the two artists took to Mount Etna in 2015, traveling with a group of volcanologist researchers to monitoring stations near its peak. The sculpture’s focus is a gridded shelf in which a variety of objects occupy various compartments: some geometric, some geological, some humanoid, all are made from a combination of compressed pigmented plaster and collected ash from Etna. With their pastel pink and green color palette, they operate as field samples from an expedition to “Fraggle Rock” or a curio cabinet collection of artifacts and mementos from a journey to the moon. Combined with Heron’s floor-bound sculptures – where the artist used his own clothing and backpack as a mold for a layered plaster pour and bisected them to reveal striated centers – the work speaks to the particular nature of geology formed by volcanic forces, as well as the combined feeling of obsession and futility in carefully cataloging and documenting your own experience. Tyson’s video is a collage of imagery culled from the trip to Sicily, a schizophrenic but well-edited collection of moments, ranging in setting from the wind-whipped surface of Etna to a sports bar where an ISIS beheading video plays on the television. It fits into Heron’s taxonomy of place, playing off of a chunky analog monitor in the midst of manufactured artifacts. One of the phrases that Bernstein uses the most to describe the emergence of themes in Due South – and within other collaborative projects that she’s orchestrated – is “ripple effect.” These unanticipated commonalities and connections emerging from collaboration in the creative process are the core of her vision for pulling groups together, rather than similarities in the approaches of the artists she calls on. Some of these commonalities emerge visually through images of land and landscape; Cristaldi and Heron’s works are complimented by Federico Baronello’s photograph of soil samples, and a print on mesh by the collaborative duo, “Concrete,” both of which echo and reiterate texture and age in a visceral way. Another link is a feeling of displacement and otherness, of seeking connection. Zya S. Levy’s audio piece is an edited collection of interviews with Sicilians, investigating their traditional use of botanical herbs in the creation of elixirs, and pulling together their personal narratives to communicate this history. The galleries present as a collection of contradictions: ambitious but straightforward, both polished and baggy, cohesive and chaotic. This, Bernstein will tell you, is a testament to the environment of Sicily itself, full of strong opposing forces. This dichotomy perhaps takes root most deeply in the work of Serena Perrone. Raised both in the US and Sicily (where she has recently developed an artist residency program), and working out of Philadelphia, Perrone served as a conduit between the two locations represented in Due South. Perrone’s Fata Morgana/Mondo Nuovo is a meticulously crafted “peepshow” that articulates something of Perrone’s experience with Tusa, the medieval town in Sicily where her family is from. Peeking inside, the viewer is entranced by an idyllic, dynamic scene of cascading vines and overgrown ruins, with pedestal-bound figures trapped in suspended animation. The precious ambiance of the space within the peepshow combined with the awkward voyeuristic sensation of peering inside through a hole in the wall speaks to the feeling of being an outsider, and the inherent impossibility of ever knowing reality from this perspective. The counterpoint to this ornate jewel is Flavio Favelli’s Damnatio Memoriae, a hulking cardboard cube occupying Due South’s second room. Favelli collected commercial cardboard boxes – sourced from Philadelphia’s RAIR (Recycled Artist in Residence) – and carefully removed all evidence of advertising from their faces, excising print and image carefully with a razor to reveal texturally appealing swaths of corrugation. These panels age the face of the carefully constructed cube, which the artist designed in part to resemble Kaaba, and create a vivid complexity and preciousness in an object that is banal and disposable through and through. The sculpture resembles an ancient site or ruin, its inaccessible interior representing a lack of access, a theme that artists throughout Due South encounter and play off of. Video work by David Scott Kessler and Marinella Senatore occupy the second gallery of the exhibition and immediately create a dynamic sense of place: audio of a voice speaking Italian into a bullhorn combined with gentle Simon and Garfunkel songs. The music emerges from a black box housing Kessler’s film, The Peasants Shouldn’t Know How Good it is, which non-linearly chronicles the annual Festa Della Madonna (Festival of the Assumption) in Tusa from a variety of perspectives, largely via stray cats. Kessler’s sensitive framing of long shots where the camera sits on the ground or a tripod create a dynamic sense of time and space, granting intimate views into specific yet timeless private narratives. The last room of the exhibition is the most thematically coalesced, and perhaps the most ambitious. With dim lighting that emerges from video screens and light boxes, the gentle soundtrack of surf, and a gilded boat – crafted by Steven Earl Weber – installed to emerge from one of the corners of the room, the viewer is placed in a subaquatic perspective. Most of the work deals with the migrant crisis that Sicily has experienced for the past several years. Refugees from North Africa seeking asylum in Europe approach the coast in overcrowded wooden boats, often drowning within sight of the shore. A beach in Pozzallo is the site of one such incident, and is directly across from a “boat graveyard,” a site where hundreds of makeshift wooden boats that once carried refugees are trashed by the Italian government. Many of the artists visited the site, and reflected on the powerful imagery of the space, articulating a contemporary crisis with global impact. While some of the work reads as painfully literal, the artists probing at this topic do so with care and respect. The unexpected but thematically appropriate inclusion of work from Isaac Julien – two lightboxes from his Western Union: Small Boats project – bring these explorations an increased weight and level of gravitas. His image of Pozzallo’s boat graveyard is polished and well-articulated, dovetailing powerfully with Matthew Mazzotta and Sujin Lim’s pared down A Day at the Beach, a video of an inflatable child’s toy dinghy rocking in the surf of Pozzallo’s beach, where tourists often swim. Both works gently suggest the gaping void of catastrophe. Aesthetically linked to the mood of this migration-themed gallery, Girgenti/Akragas, a pair of lightboxes by Kelsey Halliday Johnson, question the method and role of regional museum preservation, and offer an alternative manifestation of “artifact.” Johnson meticulously recreated a duo of lightboxes that she found at the Museo Archeologico Regionale di Agrigento that depict two ancient carved sculptures in various states of ruin. The sculptures in the images – one of Demeter, goddess of harvest, the other of Janus, god of transition – are fractured and chipping. The photographic representations of them also bear the signs of age, faded and washed out, becoming their own kind of relic. The piece’s title (translations of Agrigento, the town where this museum stands, in ancient Greek and Roman) hints too at the relationship that politics play in the preservation of objects. It is another incarnation of the contemporary relic, an aging simulacra of an aging object, and a gentle echo of much of the work in Due South that engages this element of Sicily. With these projects abroad, Bernstein has created a dynamic opportunity for the group of artists within an ever-widening circle to connect with one another. Between the geographic distance and financial restrictions that working artists face, networking in this way can be a difficult task to undertake. It is rare to encounter an organized, semi-funded project with such a wide embrace of the unknown. Most grants for artists and arts organization demand a cohesive, goal-oriented approach, a project with a pre-orchestrated conclusion that may seem antithetical to the creative process. This stands in stark contrast with curatorial efforts that are consciously more politically topical. It is this absence of preconscious goals for the exhibition that allows an arena for the artists to take risks in this setting: there is room for it. Samantha Mitchell is an artist, writer, and teacher living in Philadelphia.